I arrived in Santa Cruz in the summer of 1982 after travelling cross-country on a greyhound bus. It was my first trip to the US. I heard of a pottery school somewhere north of Santa Cruz. I called from a phone box and spoke to a Marcia McDougal. I explained my history as a production potter both in England and France, and also the fact that I was looking for work. Marcia said “Sure we can use you. Come on up”. So I travelled on the Davenport schuttle bus to Big Creek Pottery. Upon my arrival, there was a Karen Karnes workshop in progress and I was invited to join in. I was given a place to stay, and ate some truly tasty meals cooked by Mary Jane Littleton. Wow…I was never treated that good at home! I immediately felt indebted to the McDougals. I had never met such generous people. After the workshop finished and everyone went home, Bruce & Marcia McDougal took some time to look at photos of my work and Bruce said, “make some of those”. Bruce showed me around the kilns. I lied and said that I had fired a gas kiln before. That was the beginning on my 18 months living and working at Big Creek Pottery. I made pottery for the gallery at the Davenport Cash Store and produced mugs, soup bowls, ice buckets and plates for the Cash Store Restaurant in Davenport. I was left to my own devices. Bruce & Marcia would leave the ranch while I was still in bed contemplating my good fortune. Boy, did I land on my feet! There I was living a dream, with a huge workshop to myself and some 36 kick wheels plus a few electric wheels to choose from. A few days after my arrival, a freak wind lifted the barn roof and set it down in a mess 30 feet from the grain house where I was living. The only livestock left at the ranch were two pigs named Nancy & Ronald, a few hens and a rooster. The day came when the pigs were butchered for their meat. Gradually, the hens got picked off by coyotes, which left a very territorial rooster. At that time, Holly Bock and her two children (Dove and Zane) lived in the Cheese House. One day I watched in horror as the rooster attacked Zane, who is blind, by jumping on his back. I was so moved by the incident that the next morning, I entered the hencoop and grabbing the rooster by the legs, put him in a sack. I rode on my bike down to Hwy 1 with the sack and let the rooster free on the coastal side of the highway. He was never seen again. Some months later, I noticed a soil/clay deposit in a bank near the pottery and dug some out. I cleaned out the stone trough down by the barn site, and set up a levigation process. When I had enough clay slip, I spread it out to dry on canvas atop the workshop deck. I made enough pots to fill the wood kiln, which I then fired. It was my first wood firing. It was a lot of work to fire alone and the pots turned out 98% crap. Still, I got the whole process of preparing the clay from scratch out of my system. I will probably never do that again! So glad it comes in bags. Creek Pottery and I would often spend time at their house. One time as I left to go to visit them, I told Max to “STAY” and he would look despondently at me. As I rounded the first bend in the road he was out of my line of sight, and by the time I rounded the second bend, Max was already there at the West’s house waiting for me. He looked so proud of himself. I loved him. I enjoyed being at the ranch. It was a great place to live. Walking by the Footsteps of Spring as I came up to the Pond, I would see the clouds of Tricolored Blackbirds and hear their “check” call giving way to the Bull Frogs chorus as the evening drew in. Of an evening we would stroll up-hill to enjoy the sun setting and hope this time to see a green flash. At night, I could hear the sounds of the Elephant seals, carried on the wind. Having grown up in England, the Californian treescape, in comparison, hardly seemed to change, season to season, with few deciduous trees and plants, other than the obvious Buckeye and Poison Oak. Yet come the spring, I saw huge clouds of pollen blown from the Redwoods, leaving the rain puddles dusted yellow. These are images still fresh in my mind. On my first delivery and payment for the pots made, I went to Santa Cruz and bought my first 35mm camera. I took lots of pics of the countryside around Big Creek Pottery…Greyhound Beach, Swanton, Big Creek, Ano Nuevo, Waddell and Davenport. I would like to share how beautiful it was at Big Creek Pottery and say once again “Thanks Bruce and Marcia. What a wonderful experience”! I’m not sure where to begin- maybe at the ‘beginning’. I don’t remember having a particular interest in ceramics, or pottery making, but while taking a sculpture class at Cañada College in Redwood City, I believe it was late spring of ’72 (’73? ), a Big Creek Pottery flyer/ brochure on a bulletin board caught my eye announcing upcoming sessions. Within a few days, I knew this was something I had to follow up on. I must of called and talked to Marcia ’cause I remember driving down the coast highway the day before a session was starting, only discovering where Davenport was maybe a couple of days earlier, and feeling a strong pull the closer I got. I met Bruce and Marcia, I wanted to attend, and I was accepted. The next 8 weeks were pure bliss- perhaps I never felt more at home within myself as I did then- it was magic. The total immersion in pottery making, the camaraderie, the beautiful coastal environment, the old barn, the goats, geese, pigs, and chickens, the garden, the wonderful meals prepared by Annie, the outdoor showers overlooking the pond (I was convinced at the time that I would never take another indoor shower…:-)), the music, dancing, the laughter (no one laughs like Bruce & Marcia), the wine, visiting Eric Norstad’s, feeling inspired by the words of Marguerite Wildenhain through her books,… I could go on. In the studio I remember the precise beautiful forms coming from the hands of Sarah Haynes, the exuberance coming from Arnie Zimmerman as he worked at replicating the pots, the forms of Tamba ware. I enjoyed learning to throw pots a lot, but I remember really getting into helping build a Japanese style hill climbing kiln (on a much smaller scale) just down from the studio deck. One of the things I learned from Bruce that has always stuck with me, and I’m paraphrasing, ’cause I’m sure he expressed it much more poetically, had to do with understanding the “why’ behind the ‘how’. I was fortunate to be able to stay on at Big Creek after that initial session, and again at a later time. In summary, I’m very grateful for what Bruce and Marcia brought to my life mostly by their example- their love for life and each other. I always look back at that time with a smile, and I know many of the things I learned and absorbed then were a foundation for much of what I would go on to do… a big thank you. I’m really looking forward to seeing Bruce and Marcia and reconnecting with many friends. This happened every time we had a session. 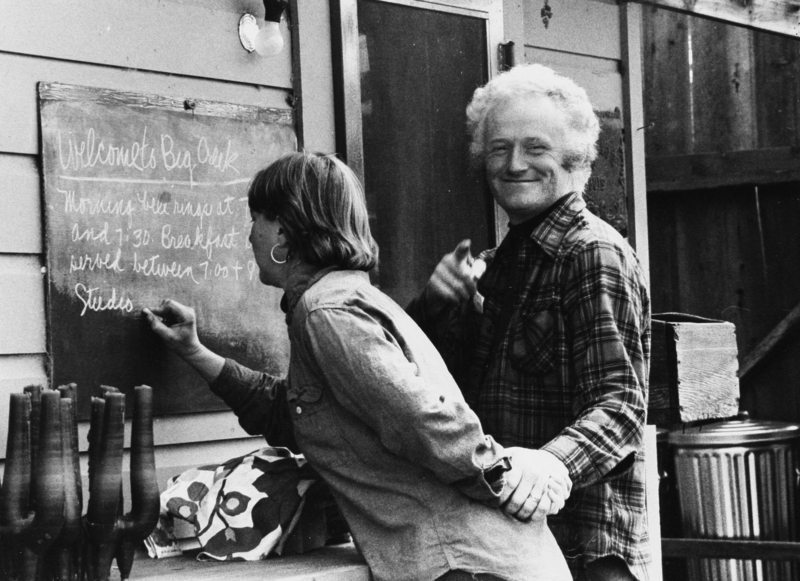 The writing on the board greeting people was a tradition. I remember I saw my job as meeting and greeting and telling people where to go as they arrived, mooching around waiting as if I would go crazy, they all took so long to arrive! But it’s a fine picture. Really, one of my favorites, perhaps because it fits so well with my world-view of the time. I spent the fall of 1971 at Big Creek when I was 19 years old. I had decided that I wanted to skip college and be a potter. Nothing was in focus for me in the academic world- clay grabbed me from the get go when I took my first class in high school. My parents, in their infinite wisdom, let me run with my dream and paid the $800 for eight weeks (maybe nine?) at Big Creek. Room, fabulous food, amazing teaching from Bruce, and a community of like-minded clay enthusiasts all for $100/week. Like everyone who has attended BC, it was a defining moment in my life, and stands out as one of the most memorable things I have ever done. After BC, I decided that college might be OK if I majored in clay and off I went to the University of Puget Sound because Carlton Ball was there (Throw them big, throw them tall, throw them just like FC Ball). I was there for the full spring term, but have absolutely no memory of Mr. Ball. But Bruce, in the short time I was at BC, gave me the muscle memory that I retained over the years for throwing a good pot, and instilled the idea of the “ perfect curve” . Remember the beautiful big popcorn bowls with their exquisite half hemisphere shape? Clay goes through cycles of fashion and I remember in the ‘ 80’ s when I took a community class at Archie Bray, the teacher thought I should “ loosen up” and give my pots more “ life” , but I was always looking for that perfect curve and finding it is still what pleases me. touch. I remember Tim, who must have stayed on at BC since I see him in the pictures posted by Sarah Cowen. The last person I remember is Stephen, who stayed in the big house and told me “ Daniel Rhodes slept in this bed” . I don’ t know why, but whenever I hear the song “ Maggie May” by Rod Stewart, it is fall and I am back at Big Creek. I recently moved to the Bay Area after being elsewhere for 40 years and am looking forward to the reunion this summer. What a great idea! Back in the late 60’s, when I was 16, I was captivated by an ad in the back of the Craft Horizons magazine. The ad was a small, horizontal, black and white photo of hand thrown pots lined up on a deck railing with mountains in the background. It was an ad for Big Creek Pottery, ( of course the image was one which we all came to know and love). Somehow I was drawn into that picture and, for lack of any better words, felt like I had discovered my destiny. I thought to myself, I want to be THERE! After high school I attended CCAC, now called California College of the Arts , and majored in ceramics. In 1972 I still had that black and white image of pots in my mind and drove down the coast to check it out. I told my parents I wanted to drop out of college and just go to Big Creek Pottery. They were not as keen on this idea and convinced me to finish school and get my BFA, which I did. For my graduation gift they gave me the money to attend a workshop at Big Creek. Six years after being mesmerized by that magazine photo I attended the 1974 summer workshop with Bruce. I arrived in my 1963 Volvo and immediately felt I was “Home”. It was almost like a spiritual awakening for me, the studio opened 24 hours, the creative energy vibrant and alive in every single person there, the most beautiful setting to create and learn, the delicious and healthy meals announced by the school bell. What wasn’t “heaven-the experience of supreme bliss” about it? From the “name game” on the first day of introduction to stoking the wood kiln, taking turns as teams, it was the best experience I ever had in helping me understand my commitment to my art AND how to live with people. Every part of my being was stimulated in a way it had never been before and it felt amazing. My experience at Big Creek Pottery changed my life. P.S. And then to think of all the relationships, marriages and children born (including my own) because of Big Creek Pottery….that is another story! I remember the kitchen shelves falling down and have photos of the whole episode. Whenever hanging shelves to hold pots I am reminded of that event. You may remember the car accident that summer, I was in it with 3 other students ,when Madeline Sadin died. I now live in NY and have kept in touch with Madeline’s parents over the years which has been good for all of us. A room is dedicated to Madeline at Greenwich House Pottery where I teach and it was rededicated last year with gift of 20 new wheels from the Sadins. I spoke about Madeline and the summer we shared at Big Creek during the reception. It was an amazing inspiring time for me to experience Big Creek , just graduated from high school and searching for an inspired way of life. I found it there! I was at Big Creek in the spring of 1973, just before my 20th birthday. I returned for Paulus Berenson’s workshop, The Serpent and the Coil, in the spring of 1974. My time at Big Creek was a turning point in my life. I am a studio potter today, thriving on the foundation I received from Bruce in 1973. Memories of working in the studio are mixed with watching sunsets from the hill, coyote howls, bluegrass music at Shakey’s pizza, cries of Bizen! I often quote Bruce’s advice on making bowls with the left handed rib pass method, applicable to so much more, “the trick is to know when to stop starting and start stopping.” I’ve taken photos of pots on my deck, overlooking a cove in Maine, mimicking the Big Creek brochure photo. I still make scrambled eggs with scallions and cream cheese. I have no photographs, but the images and memories are still very vivid. When I first came to Big Creek Pottery I wasn’t familiar with the north coast’s foggy summer mornings. As I drove up Highway One past Davenport for the first day of the workshop, I thought I was in the middle of a huge cloud of smoke. I couldn’t see anything! I really thought there was a forest fire nearby, and that I needed to get to a phone ASAP to call it in. The “smoke” was so dense that I missed the first turnoff, and went to the north end of the loop. Then I turned onto Swanton Rd. and started to climb up and up and up the curvy road, eventually getting to a place where I was just above the fog line. Suddenly the whole vista of the Pacific Ocean, sparkling in the sunlight, opened up before my amazed eyes. That was a moment I’ll never forget.